So, another book I've read is being made into a movie. I get asked all the time which I like to do first, read the movie before watching the movie or watching the movie before reading the book. The truth is, I do both and it doesn't bother me too much. Sure, I have shouted at the TV screen before, or complained afterwards when seeing a book adaption at the cinema that they got this wrong, or skipped out a major chunk of the story. But they're different, I accept that. If there's a really good movie I've seen - for example, The Dead Poet's Society, I'll watch it and if I really love it, I'll check to see if there was a book before it. I bring this up, because I've just agreed to a swap (yay!) Anyway. I don't think I'm making a lot of sense here, but whatever. 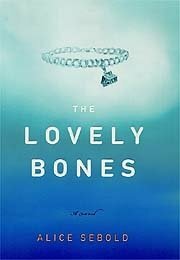 Peter Jackson is doing The Lovely Bones, should be coming out in 2007. I'm looking forward to it.